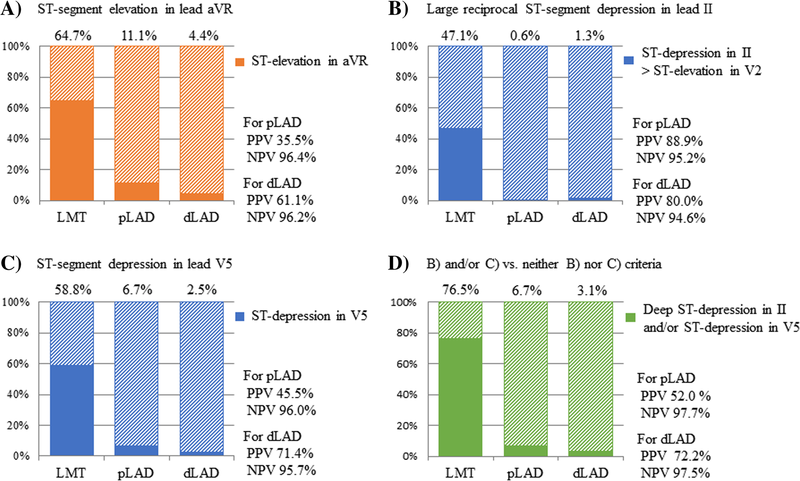 The present study demonstrated significant differences in ST-segment deviation between the LMT and LAD groups: (1) ST-segment elevation in lead aVR, (2) magnitude of ST-segment elevation in precordial leads, (3) magnitude of ST-segment depression in inferior leads, and (4) ST-segment depression in leads V5–6. 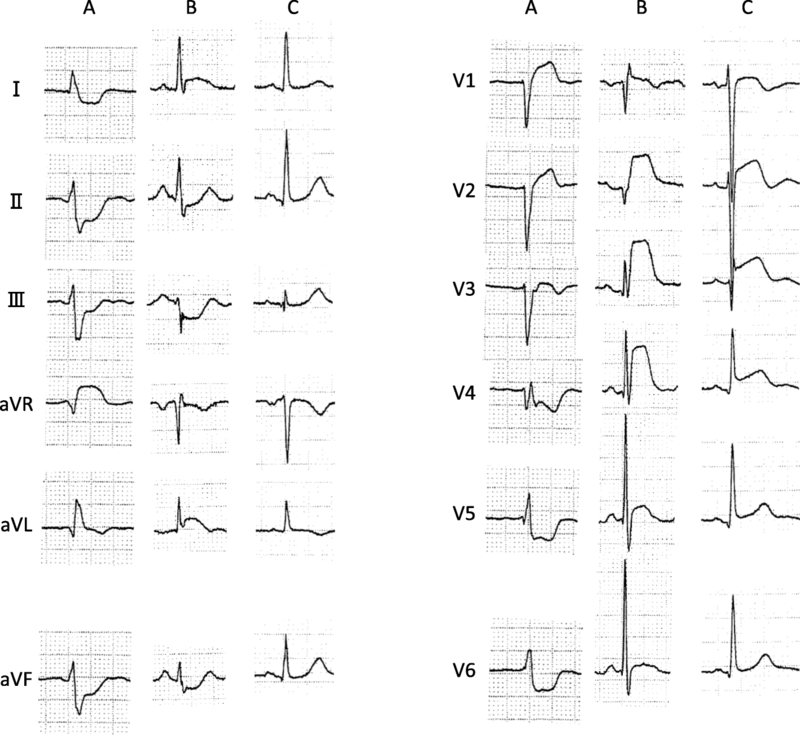 The presence or absence of ischemia in the left circumflex artery is thought to be the cause of these differences. 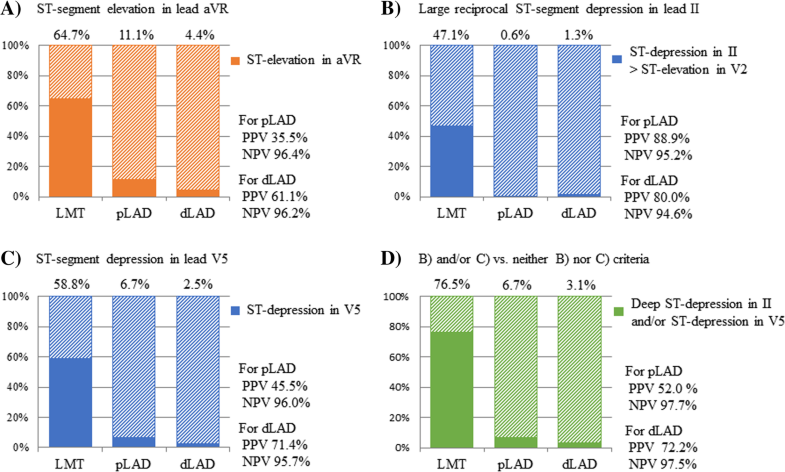 Generally, electrocardiographic features in STEMI due to left circumflex artery lesions are characteristically observed as ST-segment elevation in leads I, aVL, and V5–6, and ST-segment depression in leads V2–5 [11, 12, 13, 14, 15, 16]. However, ST-segment deviation due to an LMT lesion does not consist of simple additions of ST-segment deviation of LAD and that of left circumflex artery; ischemia in the left and right ventricular outflow tract or the basal septum, among other factors, may influence the ECG finding. 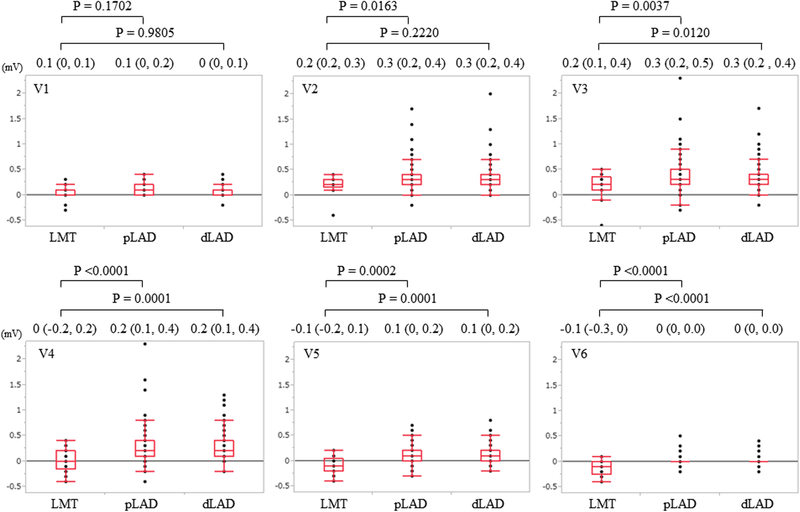 ST-segment elevation in lead aVR is the best known ECG finding for assessment of the LMT lesion [17, 18, 19, 20]. 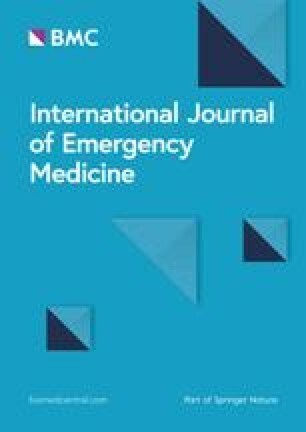 Yamaji et al. reported that ST-segment elevation in lead aVR was present in 88% of LMT lesions, but only 43% of LAD lesions . Hence it has been considered to have high sensitivity but low specificity. 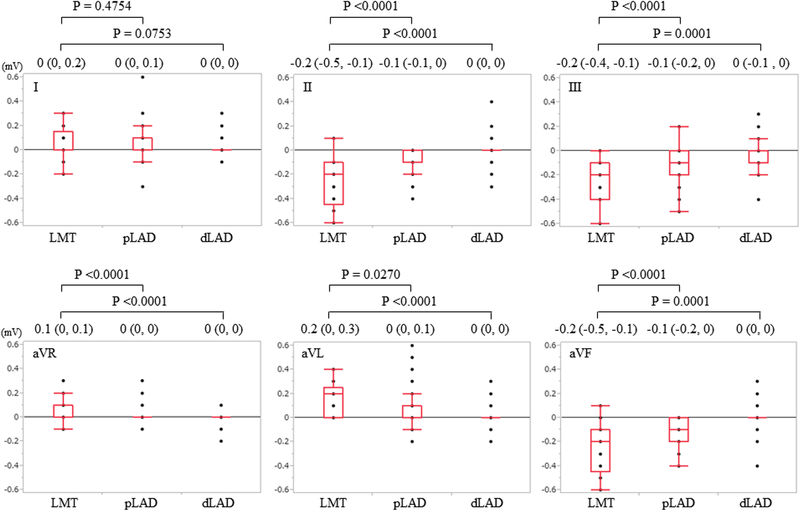 Although the proportion of ST-segment elevation in lead aVR in the present study cohort was lower in all three groups (64.7% in LMT group, 11.1% in pLAD group, and 4.4% in dLAD group) than that in this prior report, the diagnostic accuracy appeared to be adequate. 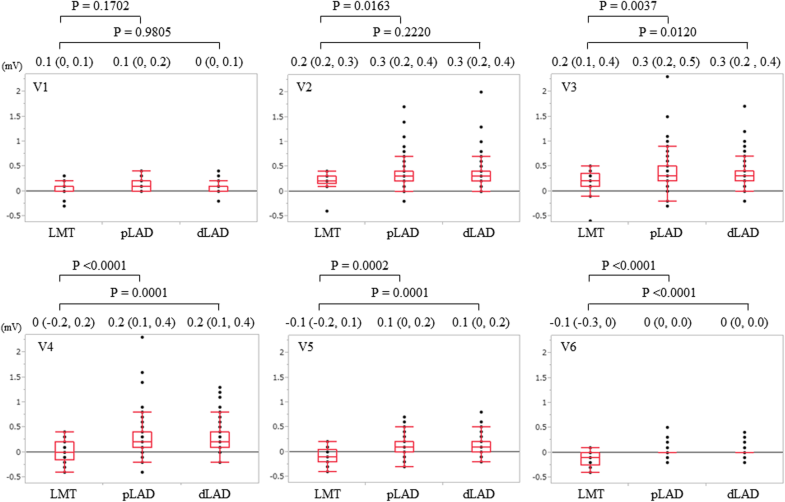 On the other hand, the diagnostic accuracy of our novel suggested ECG criteria, namely larger magnitude of ST-segment depression in lead II than that of ST-segment elevation in lead V2 and ST-segment depression in lead V5, can be regarded as equivalent to, or more than that in lead aVR; these criteria are particularly excellent in negative predictive value. The present study suggested that ST-segment depression in lead V5–6 was a distinctive finding in the LMT group. It is a finding associated with ischemia in the apical area. Apical ischemia is determined by several anatomical factors: length of LAD and supply from other arteries such as large obtuse marginal branch or diagonal branch . 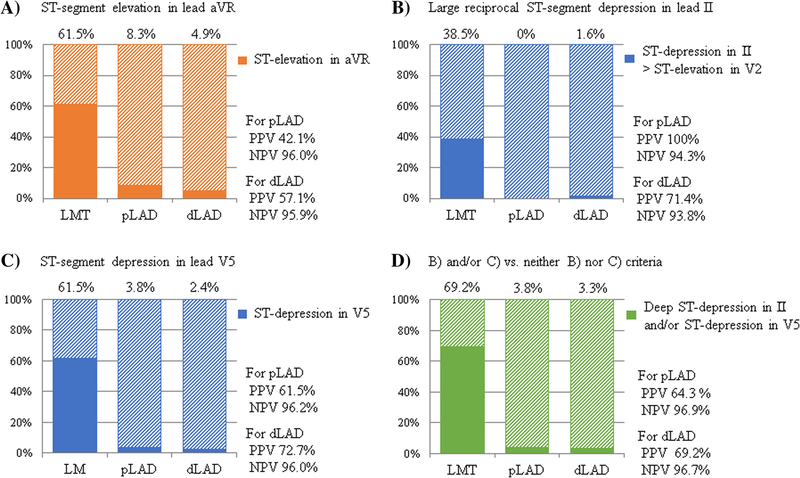 On the other hand, the magnitude of ST-segment depression in the inferior lead exhibited a significant difference across the three groups, which became gradually smaller in the order LMT > pLAD > dLAD. 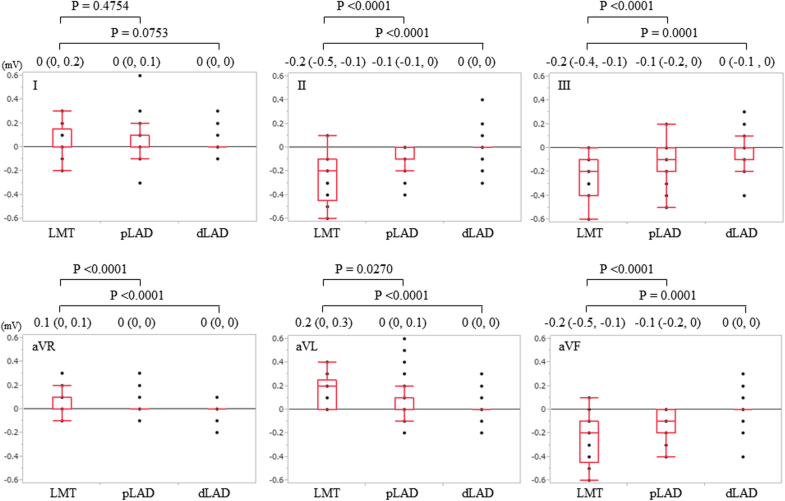 Although this occurs as a reciprocal change of ST-segment elevation in precordial leads, the above anatomical factors have been reported to be associated with generation of the reciprocal change. 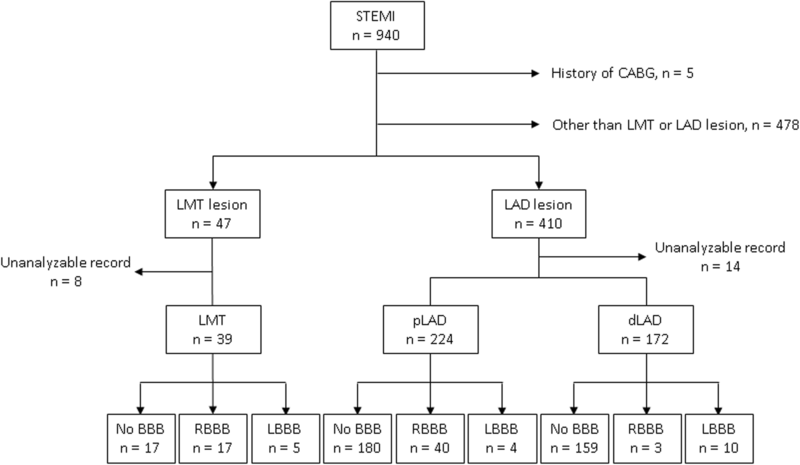 Our data agree with prior reports that reciprocal change is rare in distal LAD lesions compared to proximal LAD lesions [23, 24, 25].